The Salmon, it's our home river. At least it's the nearest with sea run fish. By the time they make it to Salmon, Idaho, they've come some six hundred miles. And that's not the end of the line. Some sockeye salmon make it as far as Redfish Lake, a distance of over nine hundred miles and nearly a seven thousand foot gain in elevation. 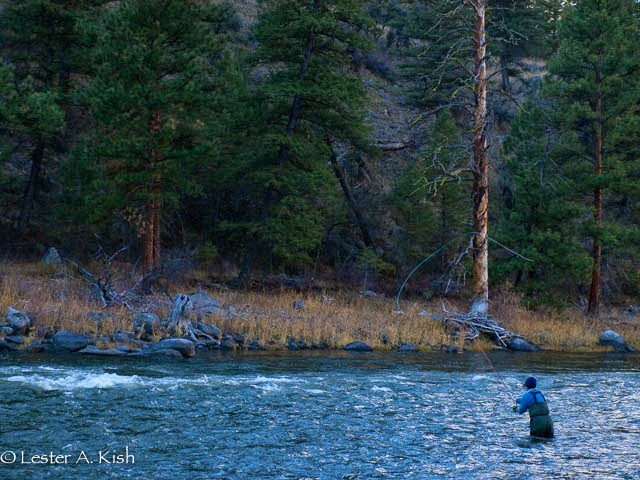 The Salmon River also supports the longest steelhead run in North America, with fish making it as far as Stanley, Idaho. Friday would be our day for a long road trip. We got up early and hit the road for the two hundred some mile long drive. It pushes the limits distance wise for a reasonable day trip. As regards comfort, it's about as much sitting as a person can take. Along the way, we crossed the Continental Divide several times. It's a scenic drive up through the Big Hole valley. Then, over Lost Trail Pass and down the "hill" along the North Fork to its confluence with the Salmon. Here, the Salmon is a "real river." Why? Well, real rivers have runs of salmon and steelhead. This was our first, last and only chance of the year to try to get in a little spey casting. Jo cast her Sage rod with Skagit type heads. She covered the water pretty well. I soon found that a "scandi" head doesn't move a tungsten cone-head leech very well. We fished a few runs with nary a bump. Midday, we found a sunny spot along the road which made for a nice lunch stop. Later, we waded into another shaded run, only to be "low holed" by some folks in a drift boat. No matter, they didn't dredge up any fish. Even though the day was comfortably warm, it was cold wading. By mid afternoon, Jo took a break to warm her knees and went back to the car. She kindly left her rod, and I went about lobbing casts with the Skagit setup. I fished through another run further downstream. No bumps other than bottom. I'd reached what I thought to be the end of the line and made the proverbial last cast of the day. Then the line came tight. A fish rolled, its tail slapped the surface and I was fast to a fish that was racing downstream. Isn't it amazing how a seemingly empty stream can suddenly come to life when you're attached to a steelhead? The hook held its bite as I coaxed the fish upstream. Once the fish was even with me, I was able to work him to shore rather easily. A pretty fish, its clipped adipose indicated it a hatchery fish. A torn gill plate further indicated a tough journey home. I bonked him. He finished his journey with a car ride over the divide. Well, it's a good thing that we took this short road trip. Temps were in the fifties over the weekend. This morning it's eleven degrees with snow on the ground. Sub zero temps are forecast for later this week. Time to round up the fixins' for a pot of gumbo. The fly rod will stay cased for a while. Interesting day trip ending with a pull and a bonk... And thanks for the weather preview, too. I hope I'm ready. Hopefully you'll escape the worst of it Walt. We're expecting 15 to 20 below tonight. Long drive notwithstanding, I'm glad that we got out of town last week. Thanks Mike. Sure made my day. Give my regards to Andre. Les: Nice Steelhead! It pays to keep casting. I'm sure the drive to the Salmon R. was also quite spectacular. I've never passed through that region (big hole valley then Salmon r.) and will have to do it one day. Nice post. It's a nice drive Bob, I'm sure that you'd enjoy it. I suspect that you would be tempted to wet a line in the Big Hole. 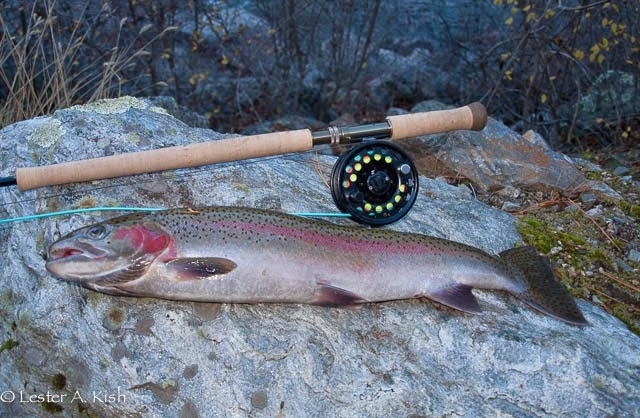 It was a nice fish, not the biggest of steelhead, but still a thrill to catch, especially at the end of the day.